The saxophone section in a big band consists of 5 players - two altos, two tenors and one baritone sax. In a traditional big band setup, the saxes are located in the first (front) row of three rows of horn players. The trombones and trumpets are found in the rows directly behind the saxes. Saxophones are considered agile instruments, much like the clarinet and flute. They are able to play fast lines or perform effects that cannot be achieved so easily on a brass instrument. This characteristic gives them the ability to cover very fast passages within the ensemble - passages that would be too difficult for the brass section to pull off. Saxophones are often called on to state the melody of a big band composition or arrangement. Playing in unison gives them the power to cut through punches and harmony played by the brass section. When stating the melody as a section (i.e. 4-5 part voicings) the lead alto player must project the lead line so it can be heard above other instrumental activity going on within the arrangement at any given time. Saxes can also be coupled with other instruments to create a homogeneous sound. Altos are often combined with trumpet, while tenor saxes are most often found sharing a melody with one or more trombones. These melodic couplings work well because the timbre of trumpet and trombone are similar to the alto and tenor respectively. Baritone sax at times plays melody alone or coupled with a bass trombone. Because the sax section covers a wide range, it lends itself well to supplying harmony and harmonic "pads" to a big band arrangement or composition. In ballads, for example, the saxes are often written as lush voicings that provide all the necessary notes of a chord. They are used in this manner within an arrangement as background to a soloist, or as a counter melody to another instrument. The tenor saxophone is one of the more popular solo instruments in jazz, so it only makes sense that tenor solos are written quite regularly throughout the big band music repertoire. Although any of the saxes are called upon at one time or another for solos, the tenor seems to get more improvised solos than the others. Baritone sax solos are written sparingly throughout big band literature. Depending on the level of skill of the players, solo sections can be passed around so that good soloists - even bari sax players - have a chance to shine. Sax solos occur when the saxophone section is featured by itself by playing a composed jazz "solo". A soli is most often composed in four or five part harmony that is voiced for the entire section. The lead line is played by Alto 1, while the rest of the section is voiced below the lead line and follows in rhythmic unison. In a four-part setting, the bari sax player will often double the alto melody at the octave. 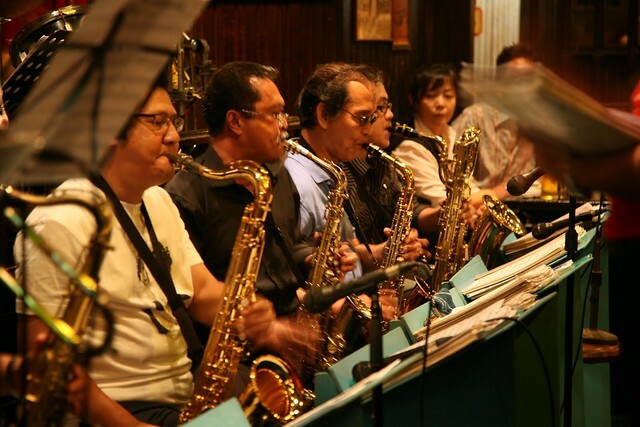 The saxophone section is an integral part of any big band in a variety of ways. Brass players may complain that the saxophones are written too many solos, but it is hard to beat a terrific saxophone section ripping through a difficult Thad Jones or Don Menza soli. As they say, if you can't beat them, join them!